February’s presidential election does not inspire confidence in the democratic trajectory of Africa’s most populous country. The Situation Room, an umbrella organization of Nigerian civil society groups, wrote that [PDF] the vote marked “a step back from the 2015 general election and actions should be taken to identify what has gone wrong and what can be corrected.” Just hours before polls were set to open on February 16, the election commission delayed the vote by a week. This was particularly disruptive for the many Nigerians who had traveled from one part of the country to another to vote. When voting finally took place, there were numerous irregularities, and many polling stations opened several hours late. There is also evidence that the security services at some stations prevented voters from casting ballots, particularly in opposition strongholds, and intimidated election commission staff. Of the more than eighty million Nigerians registered to vote this year, only about 35 percent actually voted. In the north, where Buhari is popular among the poor, turnout was around 50 percent. 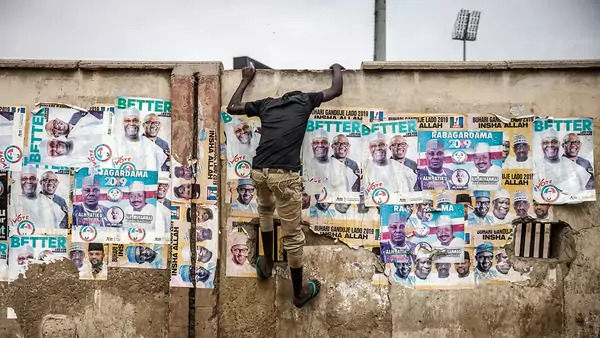 But in the predominantly Christian south and east, where Abubakar was favored, turnout stood around 20 percent, a continuation of a long decline in voter participation. Nigeria’s influence across sub-Saharan Africa is outsized. Its population and economy are Africa’s largest; its cultural influence, symbolized by the Nollywood film industry, is far reaching; and its traditional diplomatic activism, through participation in peacekeeping missions and the regional economic bloc ECOWAS, is consequential. When Nigeria transitioned from military to civilian rule in 1999, the effects on West Africa were palpable: coups lost their legitimacy, and the region has pursued a positive democratic trajectory ever since. But the latest presidential election is far from an example for those African countries consolidating their democracies or emerging from quasi-authoritarian regimes to emulate. A previous version of this article misstated the number of Nigerians who voted.